"What is in-born, can never change". There was a beautiful hermitage on the bank of river Ganges, where a group of hermits lived in peace. 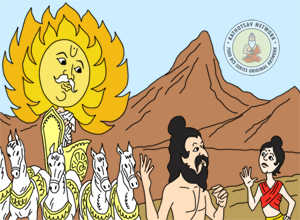 The hermits were disciples of a Guru Yadnyavalkya, who was always absorbed in meditation, and followed rigorous self-discipline. One day, while he was bathing in the river, a hawk flew over with a mouse in its claws. Suddenly, the mouse fell from the hawk's grip right into the hands of the Guru. When the Guru noticed that the hawk was flying above, he knew he cannot leave the mouse alone, or he is to be caught again. 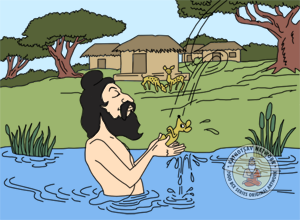 He put the mouse on a leaf of a nearby Banyan tree, and took a second bath to purify himself. He used his powers to transform the female mouse into a little girl, and took her to the hermitage. He said to his wife, "My dear, please accept her as our blessing, as we do not have a child of our own." Thus, the girl started growing in the hermitage, under the care and supervision of the Guru himself. She learnt many sciences, and ways of life. Both the Guru and his wife were very proud of their special child. One day, the Guru's wife brought into his notice that their girl had reached marriageable age. They decided to give it a serious thought, as she was a special child and deserved a special husband. The next morning, using his powers, the Guru summoned the Sun God to him, and said, "Please accept my daughter's hand. I wish you to marry her, if she chooses so." But the daughter said, "Father, the Sun God lights up the entire world, but he is unbearably hot and fiery-tempered. I do not wish to marry him. Please seek a better husband for me." The Guru wondered, "Who might be better than even the Sun God?" The Sun God advised, "Guruji, you can seek the alliance of the King of Clouds. He is superior to me, for he can cover me and my light." 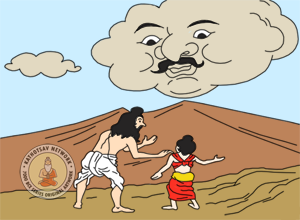 So the Guru, using his powers, summoned the King of Clouds, and said, "Please accept my daughter's hand. I wish you to marry her, if she chooses so." But the daughter said, "Father, the King of Clouds is dark, wet and too cold. I do not wish to marry him. Please seek a better husband for me." The Guru wondered, "Who might be better than even the King of Clouds?" 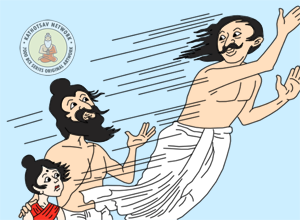 The King of Clouds advised, "Guruji, you can seek the alliance of the Lord of Winds. He is superior to me, for he can blow me away." So the Guru, using his powers, summoned the Lord of Winds, and said, "Please accept my daughter's hand. I wish you to marry her, if she chooses so." But the daughter said, "Father, the Lord of Winds is too fast and restless. He keeps changing his direction. I do not wish to marry him. Please seek a better husband for me." The Guru wondered, "Who might be better than even the Lord of Winds?" The Lord of Winds advised, "Guruji, you can seek the alliance of the Lord of Mountains. He is superior to me, for he can stop me from blowing." So the Guru, using his powers, summoned the Lord of Mountains, and said, "Please accept my daughter's hand. I wish you to marry her, if she chooses so." But the daughter said, "Father, the Lord of Mountains is too hard and rigid. He is immovable. I do not wish to marry him. Please seek a better husband for me." 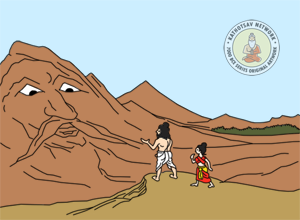 The Guru wondered, "Who might be better than even the Lord of Mountains?" 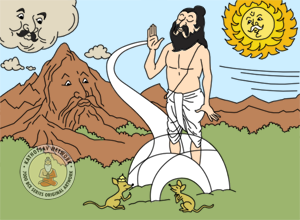 The King of Mountains advised, "Guruji, you can seek the alliance of the King of Mice. He is superior to me, for he can make holes all over me." 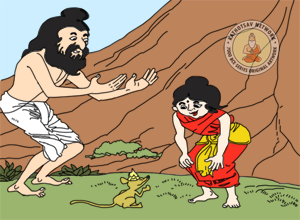 So the Guru, using his powers, summoned the King of Mice, and said, "Please accept my daughter's hand. I wish you to marry her, if she chooses so." When the daughter met the King of Mice, she was delighted and shyly agreed to the marriage. The Guru transformed her daughter to a beautiful female mouse, for her to perform all household duties of her clan. Thus, the Guru's daughter was married. What is in-born, can never change.